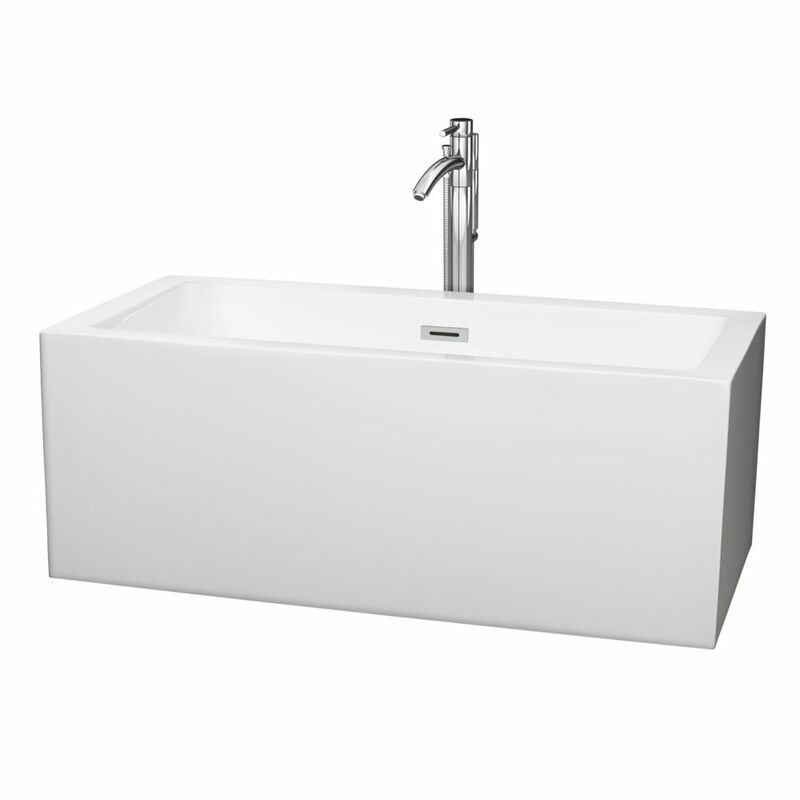 Deep enough for relaxing soaks yet occupying a small footprint, the Melody 5 ft. Centre Drain Soaking Tub in White is a superb choice for smaller bathrooms or confined spaces. Contemporary styling and clean lines contribute to the freestanding bathtub's modern aesthetic, sure to enrich your bathroom ambience and add a hint of serenity. This unit includes a floor-mounted single-handled chrome faucet along with overflow and drain outlets in chrome for a polished look. The acrylic construction is strong, light and warmer to the touch than typical steel or enamel tubs, allowing for easy installs and heat-retaining soaks. It's surrounded by a flat ledge to keep candles, oils, salts and other bath accessories nearby. Deeper than your standard tub with a chic rounded look, the Mermaid 5.58 ft. Centre Drain Soaking Tub in White is the perfect choice for smaller baths. Acrylic construction is strong, light and warmer to the touch than typical enamel and steel tubs. Included drain allows for quick and easy drainage. Melody 59.5-inch Acrylic Centre Drain Soaking Tub in White with Floor Mounted Faucet in Chrome Deep enough for relaxing soaks yet occupying a small footprint, the Melody 5 ft. Centre Drain Soaking Tub in White is a superb choice for smaller bathrooms or confined spaces. Contemporary styling and clean lines contribute to the freestanding bathtub's modern aesthetic, sure to enrich your bathroom ambience and add a hint of serenity. This unit includes a floor-mounted single-handled chrome faucet along with overflow and drain outlets in chrome for a polished look. The acrylic construction is strong, light and warmer to the touch than typical steel or enamel tubs, allowing for easy installs and heat-retaining soaks. It's surrounded by a flat ledge to keep candles, oils, salts and other bath accessories nearby. Melody 59.5-inch Acrylic Centre Drain Soaking Tub in White with Floor Mounted Faucet in Chrome is rated 5.0 out of 5 by 1. Rated 5 out of 5 by chitown from a beautiful showpiece tub/faucet combo Tub arrived before scheduled date, and is really a beautiful showpiece for our new master bathroom. It's today's version of a clawfoot - solid materials and modern but elegant design, it is a small footprint but still roomy inside. The tub filler is well constructed, has a modern body spray handle attachment, and has OUTSTANDING water pressure. I would recommend this for anyone looking for a more modern look for the bathroom, that also plays well with transitional design (it's not so modern that it looks cold and stark). Also for someone who needs a smaller footprint tub. Make sure to get your plumber the specs for this config well ahead of time - we had a lot of adjustments to make that cost us $ because we changed our tub selection - my bad. Anyway, beautiful tub, great faucet, good space saver, not cheap by any means, but IMO it fits our space so perfectly that it was well worth the money.